Giant hogweed was introduced to the UK in the mid nineteenth century as an ornamental plant. It is a highly invasive plant which spreads by seed. This plant has both fine hairs and a chemical in its sap which have the potential to cause injury to human beings. Between the months of April and August Giant hogweed grows to approximately 3-5m tall, its growth can sometimes be stunted if the roots are growing in a confined space. It is a biennial or perennial herbaceous plant with a large flat flower head comprising many hundreds of small white flowers which look like very large cow parsley. It produces 20-50,000 viable seeds a year, which are approximately 10mm and paper thin. The leaves grow to approximately 1m across. There are a number of similar looking native plants to Giant hogweed; two that closely resemble Giant hogweed in all but stature are Common hogweed and Wild Angelica. Common hogweed sap is not known to cause any human skin irritation problems however Wild Angelica is reported to cause a degree of skin irritation making it sensitive to light. It should be noted that some people will display an unusual reaction to specific plants that do not affect others, therefore if you are unsure whether you have an allergy to a certain plant or not, it is advisable that you do not touch it. What will happen if I touch Giant hogweed? Touching Giant hogweed brings you into contact with the plant hairs and possibly the sap located on its stems and leaves. The result in the presence of sunlight is a reaction in almost everyone, it can be especially acute in children: the result can be a burning, itching and blistering (phytophodermatitis) of the skin. The NHS advises to 'cover the affected area and wash with soap and water'. It is highly advisable not to touch any part of this plant without the appropriate protective safety clothing. Can I use weed killer on it? Yes. Weed killer (herbicides) if used properly can be effective on Giant hogweed. There are number of proprietary 'Off the Shelf' products that can be purchased from garden centres and DIY stores that can be used to control the growth of this plant. Herbicide is currently the preferred control method of Giant hogweed, if you are unsure seek advice at your point of purchase as to the most appropriate product. No. It is not recommended to cut down as this will expose the plants toxic sap. The result of the skin coming into contact with sap and subsequently then being exposed to sunlight can be far more damaging than contact with the plant hairs. As stated the plant is best treated by applying appropriate weed killer (herbicide). No. Burning is not advised as the plant is lush and offers little combustible material. No. The digging out of Giant hogweed is not recommended; this type of action will expose you to the plants toxic sap and the fine hairs covering the plant. As explained above both can cause skin damage. No. Living parts of a Giant hogweed plant should NOT be put in a compost bin; handling the plant when placing it in the bin will expose the plants toxic sap and fine hairs. The plant should not be placed in any other bins that are collected or in skips. If the land or property is not owned or maintained by Glasgow City Council (GCC) please visit the The Registers of Scotland website to establish the ownership. If you find Giant hogweed growing on land owned or maintained by us which is in close proximity of your own property please contact us. What if Giant hogweed is growing in a Glasgow Housing Association or a private known landlord near my property? If you find Giant hogweed growing on land owned or maintained by your Housing Association or by a known private landlord which is in close proximity to your own property, please contact them directly to raise your concern. No. We only carry out maintenance operations on land owned or maintained by GCC, we cannot undertake private operations. I have seen Giant hogweed growing on a riverbank/park/open space what should I do? We are aware that there are several sites throughout the city where Giant hogweed is growing and is well established, much of this land is not maintained or owned by GCC. However, where it is safe to do so on GCC owned or maintained property we will endeavour to minimise through appropriate control the potential for Giant hogweed to spread into the 'wild' or onto adjacent private property when awareness is raised. If you are unable undertake the actions to control and treat Giant hogweed found on your property directly then there are companies that can offer the service within the scope of their business or that specialise in 'Weed Control'. 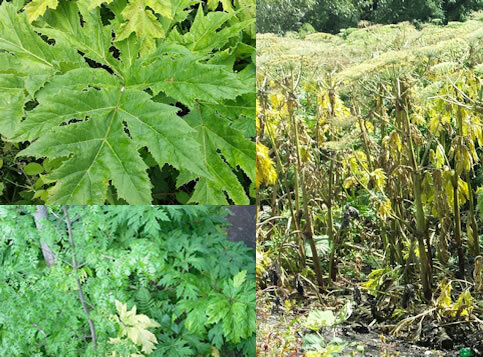 GCC cannot recommend any company or organisation to assist in the control of Giant hogweed however it is advisable that you to seek more than one quotation, ensuring that all companies come adequately insured and licensed to carry out the works required.